The Tall Trees Trail drops 630' in 1.5 miles from Bald Hills Road to a short loop through old growth redwoods along an alluvial flat on Redwood Creek. The trail is best known for the Libby Tree (variously called Tall Tree), which was discovered in 1963 by a National Geographic survey team and crowned the world's tallest tree. Tall Tree held this title until 1994 when its top died back and dropped it to 34th place. The Tall Trees Trail drops quickly through an upland forest comprised of fir, hemlock and medium-sized redwoods. Growing conditions are less favorable for redwoods at these elevations and few reach the size you'll see lower down. Rhododendron lines the trail with peak blooms through May and early June. Steep switchbacks moderate to the creek bottom and beginning of the loop (1.5 miles : 142'). Creek access, the Emerald Ridge Trail split and famed Tall Tree are just a few steps clockwise from this point. The flat loop continues under a shady maple canopy and some of the Park's largest redwoods to the Redwood Creek Trail split (2.0 miles) and back to the beginning of the loop (2.5 miles). A steep 1.5 mile climb returns you to the trailhead (4.0 miles). Those seeking a longer hike can make a loop by connecting the Emerald Ridge Trail, Redwood Creek and Tall Trees Trail. This fun route includes improvised travel up/down the banks and gravel bars of Redwood Creek. There is no maintained trail on the creek section, and numerous fords and wades are required. Only experienced hikers with a good map should attempt this route. A permit is required to access Tall Trees Grove. Free permits can be obtained in person at all visitor centers (see Contact Information below for details). Only your vehicle make and license plate number are required. Permits are limited but generally available to all comers. Bald Hill Road is narrow, windy and unpaved. RVs over 21' and towed trailers are not permitted. Drive cautiously and watch for wildlife on the road. Permits may not be available during summer holidays and peak weekends. Backcountry Camping is not permitted on the Tall Trees Trail, but is permitted on zoned gravel bars along Redwood Creek, and in designated campsites on the nearby 44 Creek Loop Trail. Water levels may limit space on gravel bars. Call ahead for the latest conditions. 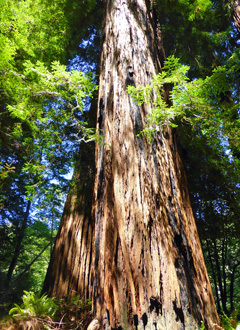 There is no fee to enter Redwood National Park or access the Redwood Creek Trail. Day-Use Fees apply at select State Park entrance stations within Redwood National Park, such as Gold Bluffs Beach ($8). The Tall Trees Trailhead is located 14 miles off Highway 101 on Bald Hills Road, just north of Orick. From Highway 101, turn onto Bald Hills Road and travel 14 miles to the trailhead. A permit is required to park at this trailhead. Bald Hills Road is steep, winding and rough in places. High clearance is advisable. Drive cautiously and watch for wildlife on the road.